What do you get the person who has everything? At ePromos, our collection of executive gifts is sure to please everyone. Any time of the year is a great time to deliver a unique and tasteful gift to VIPs. Popular suggestions this year are gifts with Bluetooth technology or exceptional laptop accessories. We have something for any exec, no matter how expensive their tastes. From bluetooth devices to premium accessories, we’ve got you covered. No matter what event you’re purchasing these gifts for, you’ll find something they’ll love at ePromos. Your company can celebrate any special occasion with a commemorative gift for employees. We can’t think of a better way to recognize a business anniversary. Celebrate your employees’ years of service and thank them for their contributions. Our gift options are perfect for making a milestone memorable, while also fitting into the budget. Here is one of the finest journal sets that features a highly visible imprint area for your brand. This set is the perfect gift idea for commemorating an event, anniversary or birthday. The journal has 80 sheets of lined paper with a ribbon page marker to keep their place. An accordion pocket on the sleeve gives them plenty of room to store loose paper. The matching ball point pen will help them record their thoughts with premium black ink. The gift set also includes a power bank made of sturdy aluminum and packed with 2,200 mAh of power. This way, they can keep their phone or tablet topped off if they prefer taking notes digitally. Give your employees something special to reward a job well done. These physical reminders will show them how much you appreciate their work for years to come. The premium quality of our executive gifts make them unforgettable momentos. 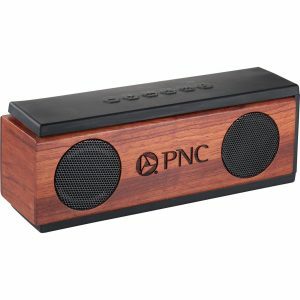 The natural wood construction gives these Native Wooden Bluetooth speakers warm, earthy tones. Two 3-Watt audio speakers fill any room with high-quality sound. This unit easily connects to a smartphone, laptop, tablet, or other device from up to 33 feet away. There is also a built-in music control on the speaker set. This gift includes a micro USB to USB charging cable and an auxiliary cable. Coworkers can enjoy up to three hours of music at maximum volume on a single charge. When you need to thank employees, we’ll help you find a unique gift that sets you apart from every other employer. These rewards are an easy way to encourage employees throughout the year. Let them know they are valuable to your company! Executive gifts are also great for a leadership team. Thoughtful executive gifts keep employees motivated and strengthen teamwork. A positive impact on your business deserves thanks. 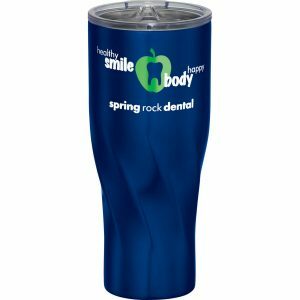 Employees will appreciate the 30-ounce mega capacity of this insulated tumbler. You’ll appreciate the company’s logo getting mega brand exposure. The first thing one notices is the sleek spinning geometric design. Next, you’ll see the tumbler has an easy-to-sip, snap-on lid. The stainless-steel liner and copper insulation keep beverages hot for 6 hours and cold for 24 hours. 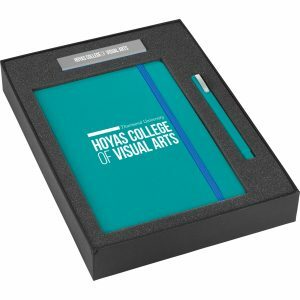 Let’s not forget executive gifts are perfectly-suited for annual awards. Get customized gifts for any occasion, including Sales Associate of the Year and Employee of the Month. Reward outside the box thinking with an “Innovator” prize for an inventive suggestion from a talented team member. Here is a must-have for every traveler. They are the perfect award for top performers. 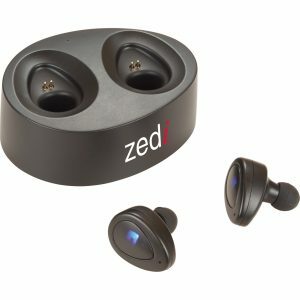 Simply sync the wireless earbuds and connect via Bluetooth. The carrying case also doubles as a charging station. And once the case charges, it is usable as a portable charger for the earbuds. The case is capable of charging the earbuds from 0 to 100% twice on one charge. Bluetooth working range is 33 feet. Playback time at full volume is two hours. Charging time is 1/2-hour for the earbuds and 2 hours for the PowerCase. Charging cable and small/medium ear tips included. When making a good impression matters, get them something unforgettable. Every business has partners, prospects, or clients they want to impress. Our executive gifts will exceed their expectations, but not your budget. Get the best brand exposure by gifting this to business associates. This computer backpack has multiple large compartments. The main compartment, with a padded sleeve, holds most 15.6” laptops. There is also a padded pocket for an iPad or tablet. Everyone will appreciate the front zippered pocket with soft lining, sized to hold a smartphone. Additional pockets and slots are ideal for holding other business accessories and keys. Plus, there are two exterior mesh pockets for water bottles. 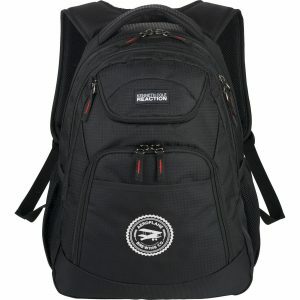 Adjustable, padded backpack straps and carry handles. Kenneth Cole® branding and lining complete the details. ePromos handles any unique executive company gifts – we’re a one stop shop for all your corporate gifting needs. Executive gifts create an exciting and effective marketing campaign. They have far more longevity than any other form of advertising. Whatever the executive type gift you need, you will find them right here! Not sure where to start? Not a problem! Our team of experienced brand consultants will help you find the perfect executive giveaway.